Sustainable design greats McDonough + Partners will soon be bringing Cradle to Cradle thinking to a city often known first for its fashion: Milan, Italy. Their Isola Office building will be aiming for LEED Gold with a variety of sustainable building strategies including solar and geothermal energy, advanced insulation panels, solar shading, and a high-efficiency climate control system. The structure will be part of the Porta Nuova redevelopment, which will introduce 340,000 square meters of housing, community, commercial and government buildings within Milan’s center – it’s practically a city within a city! As an office building situated in a residential zone, the 10-story 8,600 square meter Isola building had to accommodate a variety of site constraints, including being re-adaptable as housing units. Working within these tight parameters McDonough + Partners were still able to incorporate a variety of sustainable features. The Isola office building takes advantage of renewable energy via photovoltaics in addition to ground-source thermal capture. It also features insulation panels composed of of glass, metal, and terracotta that not only provide for a high-performance building envelope, but also allow for operable windows in every office. Mcdonough’s new office will be sharing the spotlight with buildings by 24 other architecture firms including Kohn Pedersen Fox Architects and Pelli Clarke Pelli Architects. 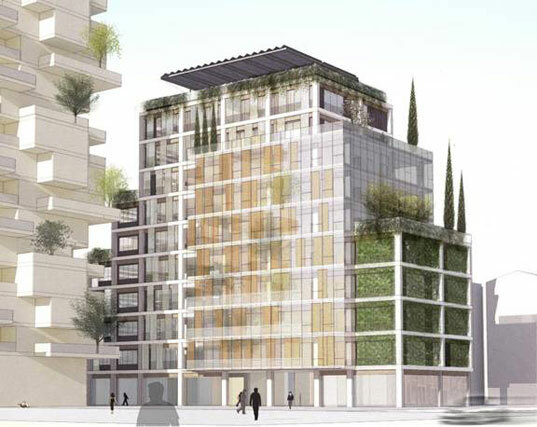 Continuously leading the sustainable movement, McDonough + Partners contribution to the Isola section of Porta Nuova will break ground as a pilot project for LEED certification of large urban redevelopment projects. Where\'s the source for this?! I\'d like to read the original source, as well as see the full size photos! Sustainable design greats McDonough + Partners will soon be bringing Cradle to Cradle thinking to a city often known first for its fashion: Milan, Italy. Their Isola Office building will be aiming for LEED Gold with a variety of sustainable building strategies including solar and geothermal energy, advanced insulation panels, solar shading, and a high-efficiency climate control system. The structure will be part of the Porta Nuova redevelopment, which will introduce 340,000 square meters of housing, community, commercial and government buildings within Milan's center - it's practically a city within a city!